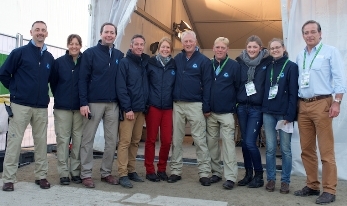 Peden Bloodstock were appoined as the Official Transport, Logistics and Stable Management provider for the World Equestrian Games in Normandie, France in 2014. A record breaking 1,243 horses arrived on 6 different competition venues to compete in 8 different FEI discilpines of equestrian sport. Our team worked closely with the WEG OC from several years out to assist in the design of back of house & horse reception areas. Peden successfully coordinated the preparation, travel, arrival and departure of all horses onto all venues. Our highly experienced team of stable managers worked 24/7 to ensure the comfortable stay of our international guests.